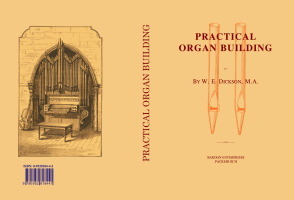 Description: This book offers a concise step-by-step description of the building of a chamber pipe-organ. Precise instructions on the tasks needed in building a one or two manual pipe organ, including the tools needed, the making of a stopped diapason rank, the sound-boards, wind-chests, bellows, action, and a section on village church organs. Dickson, Rev. William Edward. B.A. (Cantab, 1846), M.A. (Cantab, 1851). Ordained, 1846; precentor of Ely Cathedral, 1858. b. Richmond, Yorkshire, England, 1823; d. Ely, Dec. 25th, 1910. The Workshop - Tools - Lathe - Materials. Tablature, or Names of Notes - Lengths of Pipes - Parts of Stopped Pipe - The Scale - Two Methods of making Wooden Pipes - Some Varieties of Pipes - Old English Organs. 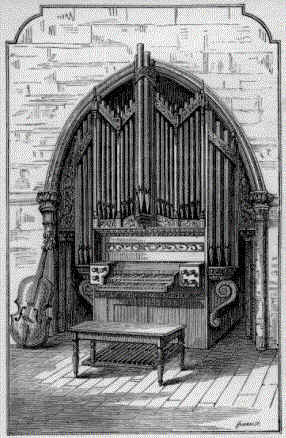 Dimensions of Organs - Construction of Sound-board - Channels - Sliders - Plantations of Pipes - Bars - Bearers - Upper Boards - Rack-boards. Grooving - Boring Holes - Conducting-boards - Conveyances. Running of Wind - Blacklead used - Pallets - Leather for pallets - Springs - How to make them - Pull-downs - Drilling - Brass Plate - Front-board. Shape of Bellows - Valves or Clacks - Cummins's Improvements - Counter-balances - The Cuckoo-feeder - Hydraulic-power Engines - Trunks - The Frame - Its general Dimensions-Hollow Frame-work - Blowing Pedal - Blowing Lever. Pipe-feet - Rack-pins - Symmetry. Definitions - Back-fall - Bridge - Square - Sticker - Tracker-Tapped Wires -Cloths - Buttons - Rollers - Roller-boards - Principle of Organ-action - Fan-frame - Keys - Roller-frame - Double Sound-board Action - Thump-ing-board. Metal Pipes - Their Construction - Nicking - Voicing - The Wind-gauge - De-fects in Pipes - Temperament - Regulation. Four Methods of drawing the Stops described - Levers - Bell-cranks - Trundles - Iron Trundles. Their Compass - Dimensions - Springs - Dip - Connection with Key-board -Removable Pedal-board. Remarks on the Swell-organ - Organs with Great and Choir-Borrowing in Two-manual Organs - Chamber Organ by Schmidt - The Swell-box - Its Construc-tion - The Swell-action - Reed-stops - Manual Couplers - Rising and Falling Bridges -Pedal (couplers - Old Method of Coupling - A Combination Manual - The Pedal Sub-bass of l6-feet Tone - Scale - Wind-valve for Pedal Chest -Violoncello Stop - Terzo Mano.